Conveyor belt systems transporting extremely sticky, muddy or difficult material present a big challenge for belt cleaning equipment. 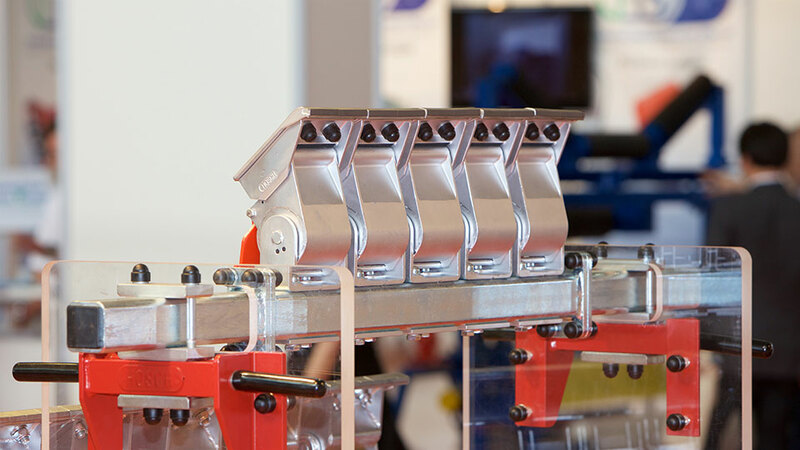 For these special operating conditions HOSCH has developed the head pulley scraper type HD which protects your conveyor belt system and makes its operation significantly easier. / Extremely robust scraper, suitable for use in the 3 o’clock position on the pulley, even with the most difficult bulk consistencies. The bulk material adhering to the belt is for the most part returned directly to the main material flow. / Worldwide unique deflecting function of the cleaning modules in the event of a faulty belt surface, thereby improving the operational reliability of the belt conveyor system. / Suitable for use on belts with mechanical fasteners (HD01®). / Tungsten-carbide tipped cleaning blades provide efficient cleaning and ensure a very long life. / No further adjustment is required until the blades reach the end of their service life. The system is almost maintenance free. / Easy installation on any kind of discharge or head pulley. If you are interested, please download addional documents or contact us.